Rep. Joaquin Castro (D-TX) unveiled the resolution Friday. The emergency order allows the president to reappropriate funds to build a wall along America’s southern border. Castro said that he has well over 200 cosponsors in the House, suggesting that the bill will fly through Congress’s lower chamber. “We have 222 cosponsors to terminate President Trump’s national emergency declaration to build his border wall. #FakeTrumpEmergency,” Castro tweeted on Friday. “I believe that if the Congress rolls over on this, the president is likely to do this again,” Castro added. Speaker Nancy Pelosi (D-CA) announced that the House will vote on the resolution next Tuesday. Pelosi also said they sent letters to Republicans seeking their support for the bill. Rep. Justin Amash (R-MI) announced that he will vote for the resolution to block Trump’s national emergency powers on Friday. Pelosi “privileged” the resolution, meaning that it will receive a guaranteed vote in the Senate after it likely passes through the House. It remains unclear if the Senate will pass the resolution, which would require at least 51 votes, or four Republicans to vote for the Democrat resolution, to pass through Congress’s upper chamber. Only one Republican, Sen. Susan Collins (R-ME), has publicly vowed to back the resolution. Sen. Lindsey Graham (R-SC), who chairs the powerful Senate Judiciary Committee, predicted Friday that a “handful” of Republicans will back a resolution to block Trump’s emergency declaration. “A handful. … [But] there will be enough [left] to sustain a veto,” Graham said, suggesting that not enough Republicans would support the resolution to override a potential veto of the resolution. Graham, who faces reelection in 2020, said that he would “absolutely not” vote for the Democrat resolution and added that he is “100 percent with the president.” Graham has urged the president to use his national emergency powers to build the wall for months. Politico reported that other GOP senators such as Sen. Lamar Alexander (R-TN), Thom Tillis (R-NC), Lisa Murkowski (R-AK), might serve as the most likely Senate Republicans to vote against the Democrat resolution. “The president has made a strong case for increased border security, but declaring a national emergency is unnecessary, unwise and inconsistent with the U.S. Constitution,” Alexander said. It doesn’t matter who the President is or what party they belong to: I strongly believe in the separation of powers and curbing the kind of executive overreach that Congress has allowed to fester for the better part of the last century, including during the Obama Administration…. I don’t believe a national emergency declaration is the solution. “I’ll be very direct. I don’t like this,” the Alaska senator said. “I don’t like this. … I think it takes us down a road and with a precedent that if it’s allowed, that we may come to regret.” Murkowski previously voted against multiple Obamacare repeal proposals and voted against confirming Judge Brett Kavanaugh for the Supreme Court. While the February spending bill did pass through Congress with a veto-proof majority, it remains questionable whether the resolution would override Trump’s veto, as both House Majority Leader Kevin McCarthy (R-CA) and Senate Majority Leader Mitch McConnell (R-KY) backed Trump’s national emergency declaration. House Freedom Caucus co-founder Jim Jordan (R-OH) told ABC this Sunday that he believes that Democrats do not have enough votes to override the president’s veto. “There’s going to be resolutions in both the House and Senate to – to disapprove what the president’s doing,” the Ohio conservative said. “I think they’ll pass, but when the president will veto them, I don’t think there’s any chance that the veto will be overridden. This would suggest that the president will beat the Democrats in a legislative battle over the national emergency, pushing the national emergency fight to the courts. 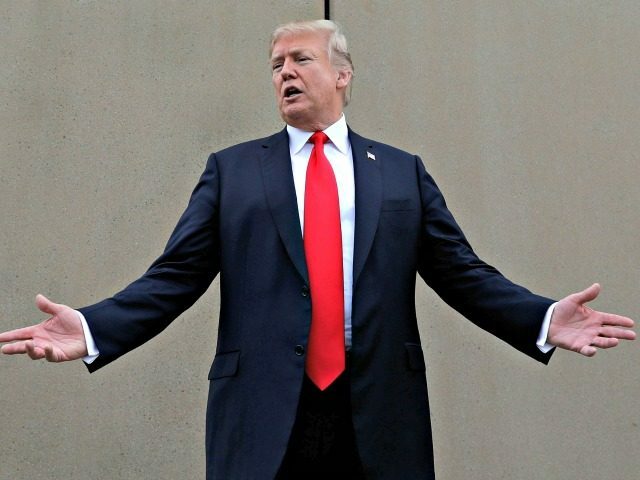 However, as Breitbart News Legal Editor Ken Klukowski detailed, President Trump has full legal authority to declare a national emergency at the U.S.-Mexico border and build a wall. “I think there are plenty of votes in the House to make sure that there’s no override of the president’s veto. So it’s going to be settled in court, we’ll have to wait and see,” Jordan added.